If you look carefully, you can see the edges of the 4 flasks that are inside of the aquarium. While we may think of light traveling at a constant speed, it’s speed can vary depending on the material it is passing through. In fact, light can slow down as much as 50% when it passes through diamonds. How light passes through objects is known as the Index of Refraction. 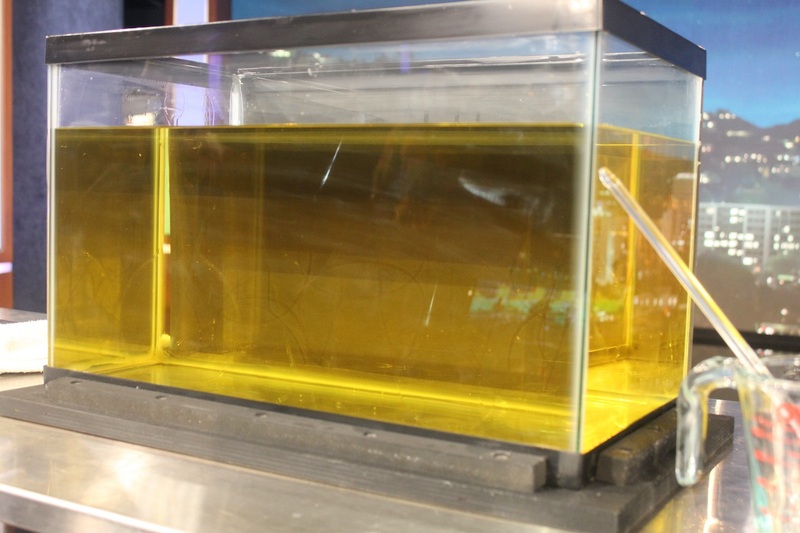 On the show, we demonstrated how light passes similarly through regular cooking oil and Pyrex glass. This means they have a similar index of refraction and so the Pyrex glassware will virtually disappear in the cooking oil. TRY THIS: If you have some vegetable oil sitting around, fill a container with the oil, (preferably a clear container) and place a Pyrex glass measuring cup in the container of oil. 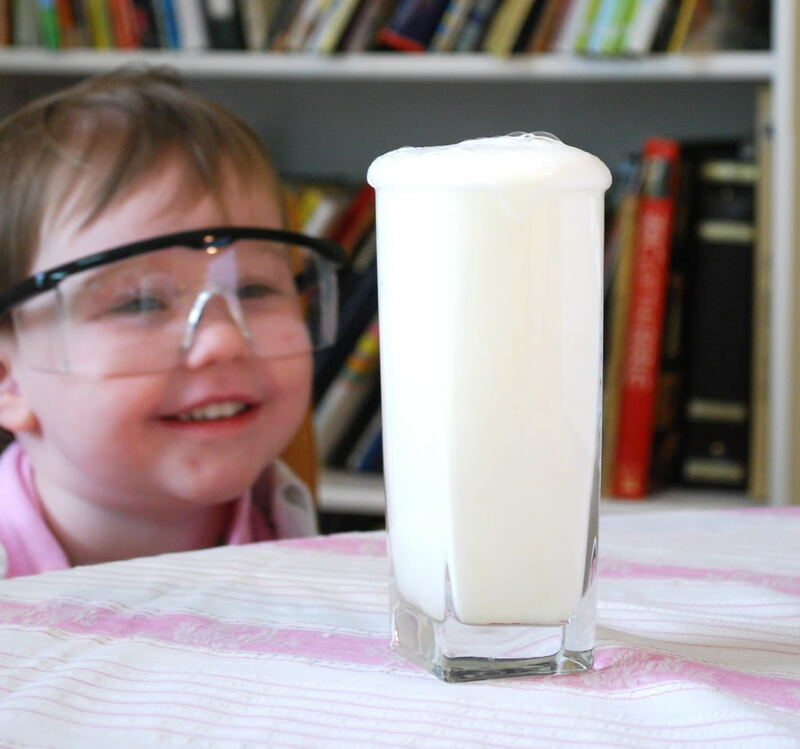 You should see that the glass part of the measuring cup disappears! 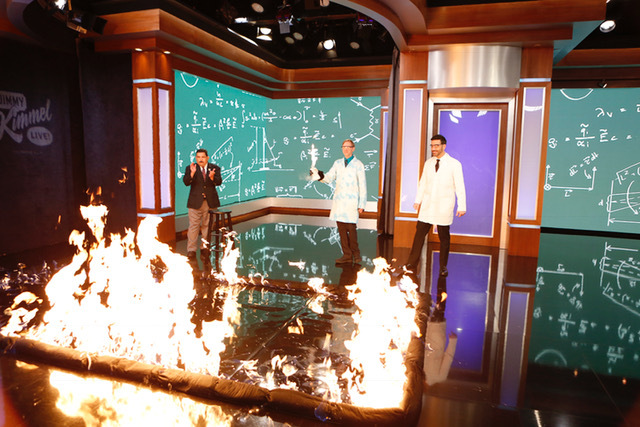 This awesome demo showed the significance of oxygen when it comes to fire and combustion. The demo uses a deep red powder called RED PHOSPHORUS. Red phosphorus is a flammable powder that burns somewhat slowly. 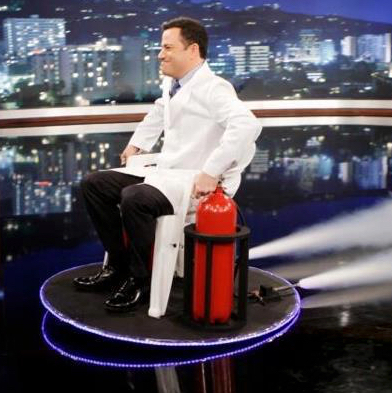 When ignited, you can see it burn and give off smoke. The giant round boiling flask is filled with pure oxygen, and as soon as it is placed over the burning phosphorus, you can see an immediate change as the phosphorus begins to burn vigorously, glow brightly, and fill the flask with a luminous-looking smoke. This phosphorus demonstration is quite old and historic – it goes back to the 1600s when German Scientist Hennig Brand created white phosphorus by boiling hundreds of gallons of urine in a quest to create gold. 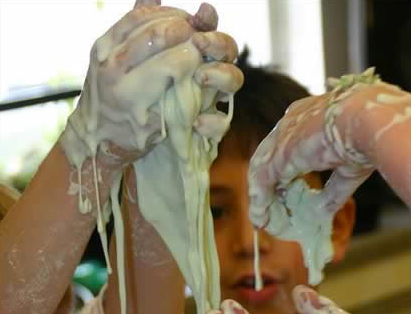 Unfortunately, there was no gold in his future, but he did notice the white phosphorus he created would glow, or become “phosphorescent.” White phosphorus, by the way, is much more reactive than its more stable allotrope red phosphorus, which we used in the demonstration. 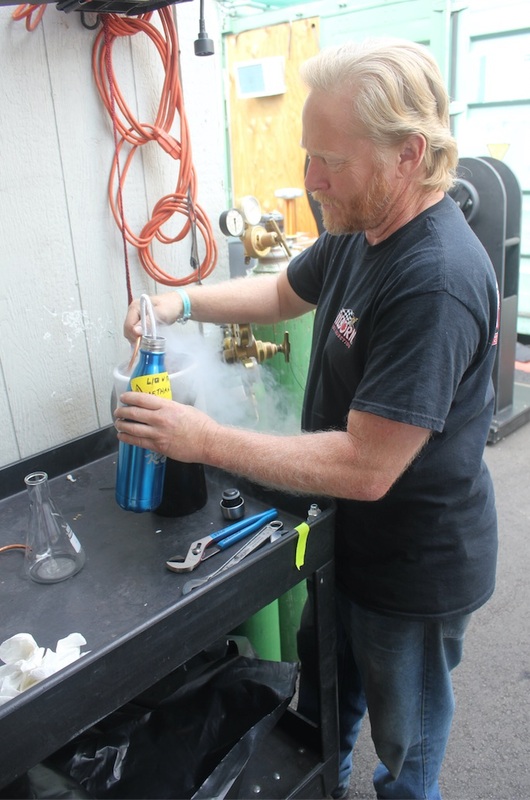 Pyro-technician, Steve uses liquid nitrogen and and modified copper tubing to make liquid methane. This demo really looked great on camera. Methane gas is a flammable fossil fuel that is commonly used in homes for cooking and heating – it is the main component of Natural Gas. We took methane gas and ran it through a modified copper tube submerged in liquid nitrogen – this cooled the methane below its boiling point, turning it into a very cold, very flammable liquid. 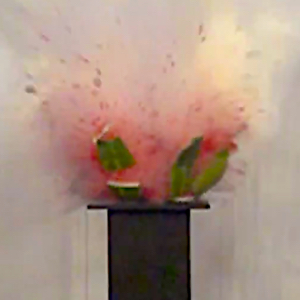 The demo also highlighted something called the Leiden-Frost effect. The best way to think about the Leiden-Frost effect is to consider how cold water on a hot pan skitters around the surface of the pan. This is because it is suspended on a layer of steam as soon as it hits the pan. 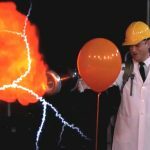 The same happens with liquid nitrogen and liquid methane – as the cold liquid comes in contact with the much warmer floor of the stage, it instantly begins to boil and spread across the surface. The drops of liquid methane will remain on fire while they vaporize creating a very cool skittering fire effect. It was time to have a little fun with science. The concept of putting a small amount ethanol into a film canister and triggering it with a spark has been around a while. But I wondered if I could daisy-chain spark gaps to create a device that would blast multiple film canisters in succession. After several tests and tinkering, I found a system that worked using a 6,000 volt Tesla coil for sparks, and wheel made of a material called Gatorboard which was non-conductive and could keep the sparks where I wanted them. If you like science and maker projects, I hope you’ll consider subscribing and also joining our Facebook community by clicking HERE. 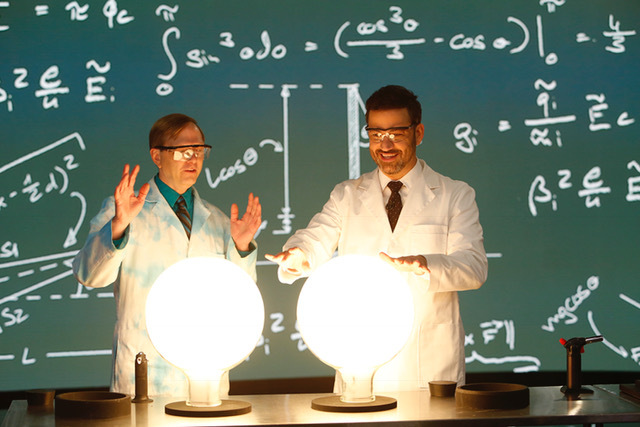 Thanks for checking out the page, and keep exploring our amazing world of science! 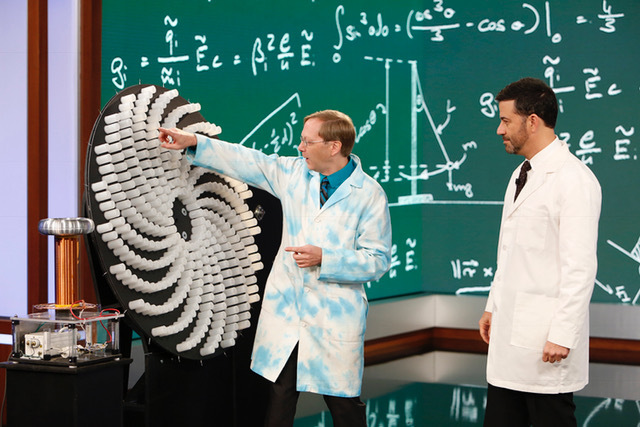 Explore the Science on Jimmy Kimmel Live!